Put the coriander leaves, onion, cloves of garlic, canned tomatoes, cumin, lemon juice and red pepper in a food processor. Process until the salsa has a fine appearance. Cut the 4 chicken filets lengthwise to give 8 thin filets. Line a baking sheet with baking paper and spray with Spray ‘n Cook. Put the 8 chicken filets on the baking sheet. Put the paprika, cumin powder, coriander powder, red-pepper powder (optional), salt and pepper to taste together in a bowl. Mix the spices through well and spread the spices over the chicken breasts. Spread the salsa over the chicken breasts to form a layer over it. Bake in the oven for approximately 30 minutes until the chicken is done. 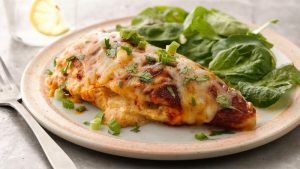 Sprinkle the white cheddar cheese over the chicken breasts and bake for a further 5 minutes until the cheese has melted. Serve the chicken with a few slices of avocado on top.